Carolyn Linton remembers well the joys of growing up on her family’s farm in northern Missouri. By the age of 8, she was helping her father by opening gates, feeding the cattle, then watching them eat through the wooded hay racks. And there were many other chores. It wasn’t work, she thought. It was fun. The attachment to the barn never left her, even years after she grew up and left the farm. But something stuck from those early days of making furniture: the love of wood. Not just any wood, but barn wood. “There’s an ambiance to this wood. You can’t buy it at a big-box store,” she says. Many years later she is still at woodworking, creating unique furniture. Linton makes her pieces on a 30-acre farm near Millersburg, Missouri, venturing out occasionally to dismantle a barn that is about to fall down—or be torn down. She sees it as “saving” the barn—saving the history and giving the barn a new life. 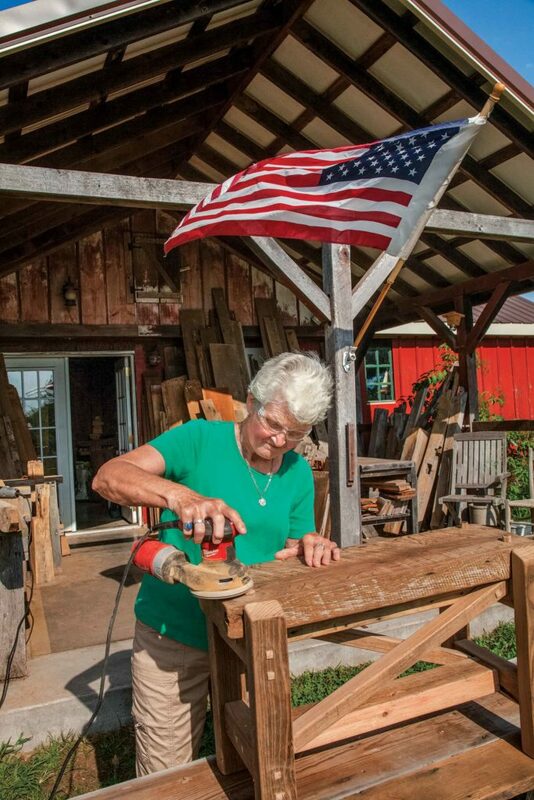 She’s saved 20 barns so far and created a wide variety of pieces—dining room tables, benches, desks, end tables. She also makes small wooden boxes with lids, the perfect size for a bottle of wine to give as a gift. Carolyn Linton in her showroom. She loves the wood, which is aged and displays a beautiful patina, and so do her customers. They have an appreciation for her connection to these barns and the history they represent. On each piece, Linton tastefully attaches a pewter medallion showing the original barn. 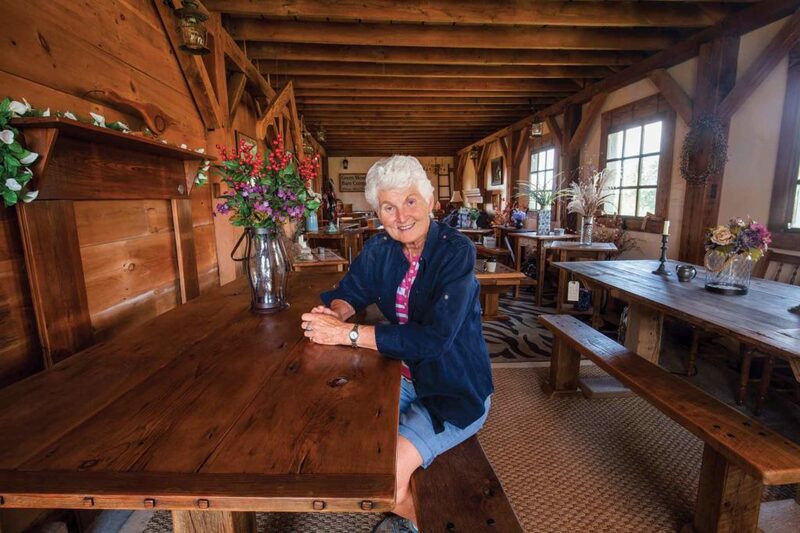 Somewhere on the piece that isn’t immediately seen—under the table perhaps— she writes a brief history of the barn, including the name of the original farm family and their location. Does the wood have “defects?” Absolutely. In almost every finished piece you’ll find nail holes, paint fragments, or ragged edges where the wood has weathered. Adz marks show where farmers hewed the wood. Not all boards are flat, nor are they square. A board from a feed trough will have an edge that’s unique—swayed and polished smooth after decades of cattle rubbing their necks on it, and Linton leaves it as is, then imagines the furniture for which the “defect’’ will work. It’s natural, it’s original. She never uses a planer on the wood. “If you plane it, that takes away the character. It changes the whole story.” Instead, everything is hand sanded, then finished with a high-quality furniture wax. Most of the large beams are checked with large, long cracks, the sign of wet wood wanting to twist as it dried. But it couldn’t twist because of all the mortises, tenons, and pegs—strong joints that stood the test of time. “When people would go into an area 125 to 150 years ago, they would just cut the trees down, saw them up, and make them into barns,” says Linton. “So you had green lumber that was drying as it stood. The natural reaction was for the wood to just split. That created a tension that gave it strength. Carolyn Linton never tries to make her wood perfect. She doesn’t use a planer, but only gives the wood a light sanding. She finishes her pieces with a wood paste wax. When Linton bought her 30 acres 20 years ago, nothing was on it. But she quickly made it her unique home, a place that looks like it was settled a hundred or more years ago. She built the house first. Naturally, it’s an old barn she disassembled and moved here. Another old barn was next, rebuilt to shelter her daughter’s horses and give Linton much needed storage space for her wood.